New Ranet OLAP HTML5 Pivot Table 5.7.225 is released. In the updated version icons are redesigned, modal windows can be dragged around. The search for elements became faster. 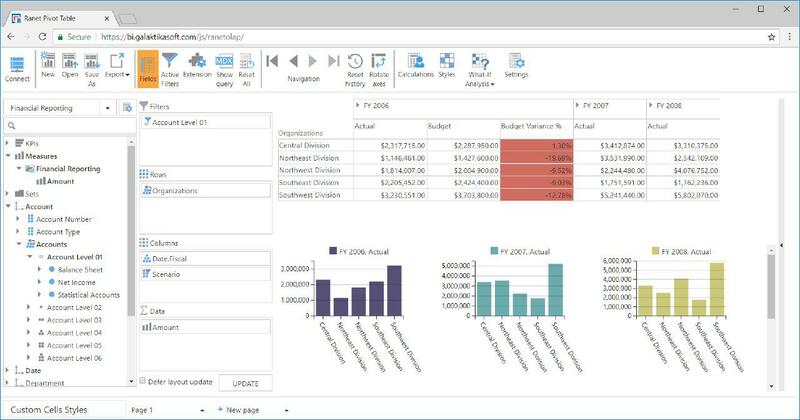 There are new pivot table features that allow simplifying work, make it more convenient. The area configuration is extended, new options are added. Thus, a color picker is implemented in the cell styles designer and sparklines can be added to pivot tables. Besides, in the new version reports are exported much easier. There has been a change in AngularJS application as well. If you want to learn more about mentioned options and other advanced features visit https://galaktika-soft.com/blog/new-version-of-ranet-olap-html5-pivot-table-5-7-225.html and https://galaktika-soft.com/ranet-olap/whats-new/html/5-7-225. You also can download a new version of Ranet OLAP HTML5 Pivot Table following the link https://galaktika-soft.com/ranet-olap/download.